The dwarf frowned, there were too many out on the street at this time of day to be able to take out the patrolmen without attracting more guard. He turned to Ludo. “Any chance you can find us another boat? Or a means of sneaking out our weapons at the very least?” Currently, the dwarf’s axe and crossbow were bundled up in his cloak and strapped onto his backpack, but it wasn’t difficult to guess by the shape what the bundle contained. The rogue nodded. They explored a bit, looking for a suitable place where Ludo could put his plan into action. Eventually, they found a spot out of sight of prying eyes. Feldard was almost beet red at the thought of having to hand over his axe once again. What if the rogue got caught climbing over? It was daylight now, not the dark of night. But what choice did the dwarf have? With a glare that warned of dire things to come should there be even a slight scuff to his blade, Feldard handed over his axe and then proceeded to follow the others to the northern gates. Stephan handed over his bow checking as he did that the tension was loosened. “You rogues are always handy in a town,” Stephan said. Ludo turned to Stephen, “I will meet you at the dam.” The rogue uncolied his rope and grapple, then nimbly scaled the wall and at the top made sure that all was clear of the town guard. Fortunately for Ludo, the town walls were designed to keep enemies out, not trap people in. He carefully lowered the weapons to the ground. Wouldn’t want to put a dent in Feldard’s axe was a thought that crossed his mind, Feldard would have a hernia. He then proceeded north along the road to the dam to meet up with the others. Back in the town limits, Feldard was sour and silent the entire walk. He grunted and glared at the guards at the northern gates as they passed through. Miklos was thankful that although practicing magecraft in Threshold was against the law, ‘rare book dealing’ was not, however he did his best to huddle amongst his friends as they passed by the gate guards careful not to attract attention. Hasan enjoyed the moment. It was goodbye to the town and guards, and that was all he had been waiting for. “Cheerio, old man,” the elf nodded, as the grizzled old soldier glared at the departing party of campaigners. “We’ll see you on our return. Do keep the light on,” the elf joshed. Maruc nodded at the guards as he passed though and offered a blessing. His view was filled with towering mountains that climbed to the skyline. The peaks frosted with snow promised a hard path. He wondered as he turned onto the northern pass road what guardian had kept this pass blind to the adventures of the past that travelled this way before. Never to return. But the favour of Halav was with him and paths of faith are never easy. Maruc smiled when he saw Ludo sat on the side of the road with their gear. As the others pulled their wargear back on Miklos opened the tapestry and studied the lay of the land. The tapestry clearly indicated a river leading north into the Black Peak Mountains. 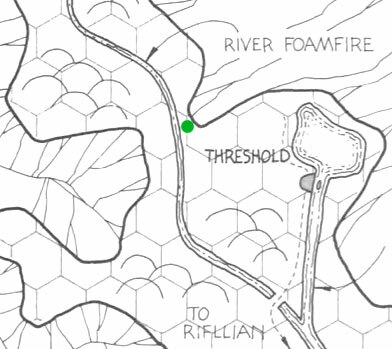 The group would have to cut across a few miles of hilly terrain to meet the Foamfire River, otherwise, they would have had to waste time backtracking to Rifllian. It was late afternoon when they reached the river, and not long after they arrived at the mouth of the Foamfire Valley. As dawn broke, the elf led led the party north, the Foamfire slipping by steadily on their left. The broken landscape was hard travelling, and there was no path, except for the faintest of gametrails along the river’s rocky bank. Ludo settled gratefully to the ground, a rest was welcome after the hard days tramp through the wilderness. He removed his boot and tipped out a small stone that had somehow made its way in there and been bugging him for the last couple of miles. He felt good, now that Golthar was dead, however they were travelling on the fringes of civilization going deeper into the wilderness where all sorts of dangers lurked, they would have to be on their guard. “Hasan, keep the fire low, I suggest we start to keep watches overnight, we have no idea who or what is in these woods and it would do us no good to be attacked unprepared. I will take first watch. The following morning just after dawn Ludo filled his canteen from the river and chewed on some salted beef whilst he waited for the others to shake off the night’s sleep. Exploring the unknown wilderness filled him with excitement; he could sense they were getting closer to their goal. As they marched off Ludo followed Hasan as he led the way through the undergrowth keeping a careful eye out for anything unusual or out of place. Maruc settled down, he’d hardly notice the weight of his aromur now. He cast his mind back to when he first wore it. All his sore joints used to give him alot of pain, but it had subsided now, thank Halav. Maruc spent his time between healing and meditiating until all his friends were at full health and he was armed with fresh blessings from Halav. The mage took the time to create more continual light stones. He mused over the information they had so far. Miklos sat and copied Golthars spells into his book and memorised those he thought most useful. The dwarf was content as they set camp. They were well away from city now and he could feel the ground beneath his feet was more stone now than soil. This reminded him of home. Feldard volunteered for the midnight watch knowing that the spellcasters preferred uninterrupted sleep and that his infravision would give him an advantage during the darkest part of the night. In the morning, Feldard helped clean up the camp, dousing the last remanents of the fire used to cook breakfast. The magical map was once more tucked away into his pack and his axe was nicely sharpened and oiled. He was looking forward to this leg of the journey. The dwarf even smiled as they set off towards mountain valley. As they set off, Ludo looked back and saw Feldard smile – or was it a grimace; he wasn’t sure. Stephan also felt what he sensed his companions mood to be. He found himself strangely elated to be venturing into the mountains. Threshold and Golthar were shed off now like scabs of old wounds. The path ahead looked up. It promised the unknown and mystery. It held forth the promise of confronting evil. It was just his cup of mead. And it seemed that he was in good company that also felt this surge of vigor, hope and excitement. He slept well that night, taking the third watch and ensuring a merry breakfast awaited his mates as they rose. Setting out, he found it difficult to keep up with the dwarf.